One of the top three global point-of-sale providers, MICROS which was purchased by Oracle in 2014, has been breached. This is quite the cause for concern, as MICROS is currently deployed in over 180 countries, to over 330,000 sites. Oracle did acknowledge security journalist, Brian Krebs, stating they had “detected and addressed malicious code in certain legacy MICROS systems.” While the company also claims that payment data is not at risk, as that “information is encrypted both at rest and in transit”, Krebs still warns that the support portal could be an issue. Oracle has encouraged all customers to reset their passwords immediately for the MICROS online support portal, but have noted that Oracle’s own systems, corporate networks, and cloud services were not affected. Point-of-sale based malware is a growing problem. Hotels, restaurants and retail locations are considering prime targets for hackers to steal credit card information. 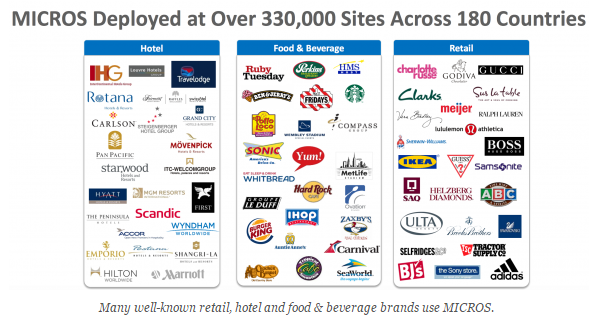 In the past twelve months we have already seen breaches at Trump, Hilton and Hyatt, to name a few of the big players in the hotel industry, and we cannot forget about Target and Home Depot in the retail sector. Once attackers have installed their malware devices onto the POS devices, it’s simple for them to remotely retrieve data from any and all cards processed.